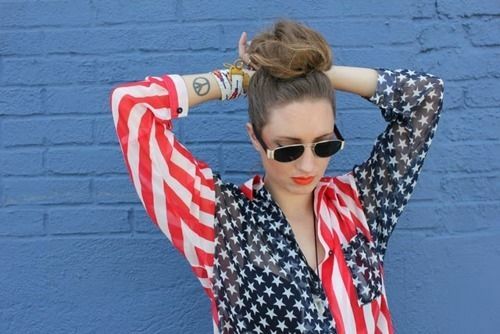 cat eyes & skinny jeans: Happy, Happy 4th of July! May your day be full of beachside bonfires, sunkissed skin, and colorful fireworks lighting up the night sky! happy 4th of July, dear! Happy 4th to you as well lovely! Wishing you lots of fun today! Happy 4th! Happy 4th! Love that shirt! Have a fab weekend - know you will! BTW, just saw Sofia Coppola's new movie, very ennui! Cute picture! Have a wonderful 4th of July! TY & the same to U2, Erika! Stay Same & Sane...and Cool! Happy July 4th!! love your pictures. Holy cow! Love the shirt.....It makes me want one!! Who needs fireworks with shirts like that?! Right!!?? Even though I don't live in the USA, happy fourth of July to all that do! Happy 4th of July sweetie! i want that shirt :) hope you had a great holiday too! you had a great 4th July and celebrated in style. Even though I'm Italian...happy 4th of July! This shirt of yours is amazing! I hope you had a great 4th!